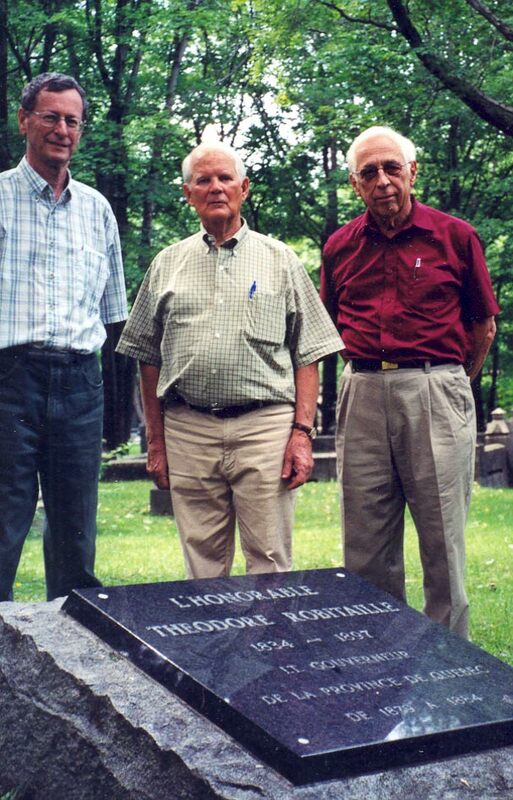 The three artisans of the restoration of Lieutenant Governor Théodore Robitaille's gravestone: René, president of the Association in 2002-2003, Paul-Eugène who provided the plaque and saw to its installation, and past president René who oversaw the project. The Honorable Théodore Robitaille can rest in peace. Yes, this noble representative of the Robitaille family, who was lieutenant governor of Quebec from 1879 to 1894, can rest in peace. And this is thanks to the tenacity of our past president, René of Quebec. For several years, René had noticed that Théodore Robitaille's gravestone had been vandalized and was falling into ruins. Having learned that Theodore had no descendants to look after the upkeep of the gravesite at Belmont Cemetery in Quebec, René undertook several initiatives to ensure that this memento of our heritage was not forgotten. Our Association supported him in these endeavors and agreed to become the owner of the cemetery plot and responsible for its future upkeep. The monument had to be restored because the bronze letters had disappeared making it almost impossible to read. With the research under way, Paul-Eugène Robitaille, from the Granicor Company and, at that time, one of the directors of our Association, offered his help in carrying out the restoration. He prepared a granite plaque with the inscription engraved in the stone making it more resistant to bad weather, and he had the plaque installed on the original monument. All of this was done free of charge by our friend Paul-Eugène. The restoration made it possible to correct an error in the original inscription. It had shown 1898 as the date of Théodore's death. However, official documents indicate that he died on August 18, 1897 at the age of 63. Théodore can now truly rest in peace. Thanks to our past president, René, and to Paul-Eugène for their help in preserving this collective souvenir. 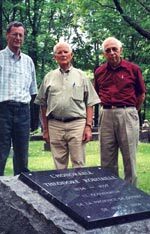 On August 3, 2003 the Board of Directors met with Paul-Eugène at the Belmont Cemetery for the official unveiling of this funerary monument. Then the group met at Robitaille Park to mark the tenth anniversary of the monument commemorating the arrival of the Robitaille families on the ancestral land in 1670. On that occasion, the president also met with all those who helped in the creation of that monument in 1993.